Dagsfest i samband med Way out West festivalen på Trädgår'n! 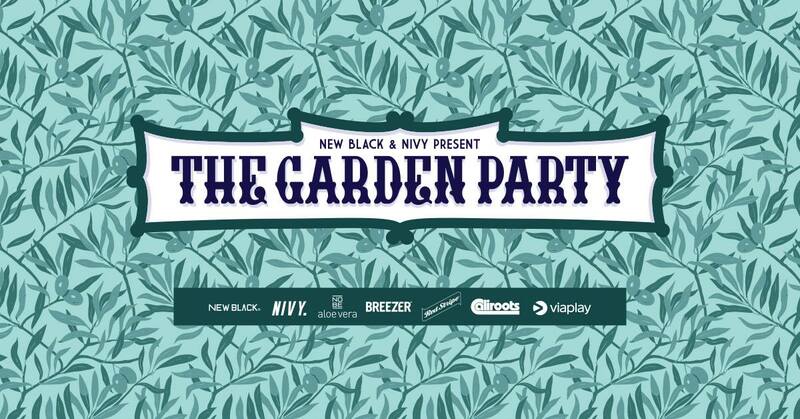 New Black and Nivy have joined forces for the festival weekend in Gothenburg to give you the best day time party of the year! Join us on Friday August 10th at the enchanting Trädgår’n for energetic DJ sets and live performances by some of Sweden’s most exciting artists. This event is not a part of Stay Out West, it’s open for the public. Tickets are now available! Jireel debuted in November 2015 with the song ”Här och Nu” and have since then kept on delivering hits after hits with his cocky and modern style. Songs like ”Som Mig”, ”Langa Luren” and the massive hit ”Cataleya” made 2016 his breakthrough year. His debut EP ”Jettad” from 2017 is already being talked about as a Swedish hip-hop milestone. When Jireel had the honor of closing the Swedish Grammy Awards the same year we got to see just what a great live artist he is. Last year he kept on delivering hits with songs like ”Man Of The Year” and ”Tagga”. Going city to city touring throughout Sweden, dropping his new album ”18”, performing at P3 Guld award show where he also won ”Artist Of The Year” and multiple Grammy nominations, the young star has 2018 on lock. This is just the beginning for Jireel! Denz, the 24-year old rapper from Stockholm, made a name for himself back in 2014 with his single ”Jetski” which gave him thousands of listeners on SoundCloud, Spotify and YouTube. But the song that really gave him a buzz in Sweden was his track ”Måste” later that same year – it’s reached more than 1.500.000 views on YouTube and 2.500.000 streams on Spotify. In the spring of 2015 he released ”Varje Dag” and ”Jag Har Den”, produced by NIVY’s own Jeff Roman. With over 20 million streams on Spotify, Denz is finally about to drop his debut album with his latest single ”Kasta Tillbaka”. After a handful of guest appearances and street singles Seedy debuted in November 2017 with his single ”Alice”. The big song featured NIVY members Jireel and Denz and was produced by Jeff Roman. Seedy quickly gained attention and have been touring the country together with Jireel. His new single ”Gwara Gwara” is out now! Melina Do Rosario is a Gothenburg based DJ, dancer and creator who was one of the people behind the creative collective TU5EN. Other than club gigs all over the country she’s been an opening act for Bryson Tiller, Jireel and Parham. When Melina is behind the decks you can expect a great vibe with UK tunes, afrobeat, R&B, dancehall and hip-hop! Do not miss one of Gotheburg’s most appreciated DJs at The Garden Party! NIVY was founded back in 2015. Apart from the impressive roster of rappers that the label holds NIVY is also known for their great DJs that make up NIVY Sound. Kristian Riffo, Haile and Jeff Roman are known to have the crowd moving and August 10 won’t be an exception! Diego is all about spreading good vibes! The DJ and YouTuber has taken Sweden by storm with DJ sets all over the country. His set at The Garden Party is good vibes and good energy guaranteed!